Global All Cap - Epoch Investment Partners, Inc.
Seeks superior total risk-adjusted returns by investing in a concentrated portfolio of companies worldwide. Our Global All Cap strategy pursues long-term capital appreciation by investing in a diversified portfolio of global businesses we believe have superior risk-reward profiles. Our bottom-up security selection and risk management process leads to a portfolio of 60-80 stocks. Companies are selected based on their ability to generate free cash flow and allocate it intelligently to benefit shareholders. The bedrock of our philosophy is that the growth and applications of free cash flow represent the best predictor of long-term shareholder return. As a result, our security selection process is focused on free-cash-flow metrics and capital allocation as opposed to traditional accounting-based metrics such as price-to-book and price-to-earnings. We look for a consistent, straightforward ability to generate free cash flow and to allocate it effectively among internal reinvestment opportunities, acquisitions, dividends, share repurchases and debt pay downs. An essential factor is the evaluation of each company’s management team to confirm their commitment to transparency and building shareholder value. The companies uncovered by this process have inherently less volatility due to their ability to generate cash flow. 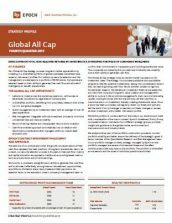 The Global All Cap strategy looks across the market cap spectrum for investment ideas. The strategy incorporates qualitative and quantitative analysis to identify potential investments, taking into consideration factors that can lead to growing cash flow. Stocks are then subject to rigorous fundamental research. We develop an investment thesis as we assess the sources of the company’s long-term value creation and management’s ability to nurture it. We scrutinize management’s track record of allocating capital, looking for those with the discipline to use free cash flow to maximize return on investment, thereby creating shareholder value. Once a stock has been purchased, we regularly revisit our thesis and typically sell the stock if our price target is reached, our thesis changes or we see another investment with a better risk-reward profile.